-----Those who come before, put a stamp on those to follow. And so it is with a river. To understand the Mississippi, one must know its past. And its roots lie deep within ice. 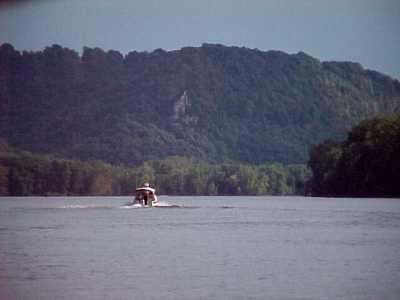 -----Navigation along the Mississippi River has existed since the first Native Americans drifted on log rafts and, later, paddled canoes along its water. These shallow draft vessels could navigate the shoals, branching channels, rapids, and snags of the mighty river. It was a source of food and a highway for communication and travel for the first tens of thousands of years of occupation along its banks. -----When Europeans arrived on the continent, they utilized the rivers for their transportation needs. My ancestors arrived at their New World home by stepping ashore off a Hudson River boat. For generations, most of their goods arrived by river and their crops were sold down the same river. In 1807, Robert Fulton powered a steamboat up the Hudson. It was the beginning of a new era. -----The Mississippi River, and its great tributaries, the Missouri, Ohio, Illinois, Kaskaskia, and Arkansas had long been a major water highway to Natives Americans and European fur trappers, traders, and settlers. With the advent of steam power, the interior rivers could be navigated with large vessels both up and down river. 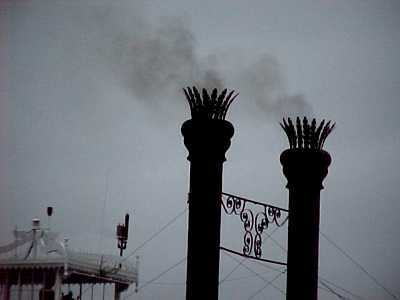 In 1811, the first steam boat arrived in New Orleans. The steamer Zebulon Pike arrived in St. Louis in 1817. In 1823, the Virginia became the first steamboat to reach St. Paul and open the Upper Mississippi for steam power. It made the trip twice that year, and heralded the opening of the Far West. -----To understand the Mississippi River, it is first necessary to understand ice. The Mississippi is the daughter of the Ice Age. Twenty thousand years ago, the entire northern portion of North America was buried under a vast ice sheet. Canada looked like Antarctica does today, and it would have been easier to cross the Greenland Ice Cap tomorrow than cross Illinois then. The vast blanket of ice buried almost all the mountain tops in New England, and was perhaps ten thousand feet thick atop northern Ohio. Where did the ice come from? ----- It is easy to understand how glaciers flow down a mountain, pulled down hill by gravity. It is quite another leap of imagination to visualize the flow of a continental ice sheet. It is perhaps best to think of trying to pour a pile of honey six inches high in the middle of a table. Almost impossible, since the honey will flow outward from the center of the 'pile,' through its own weight. So it is with the Ice Sheet. If it snows more than can melt in a year, snow will accumulate thicker and thicker. From its weight, it will compress itself into ice. Then it will flow outward, in all directions, from the center of the 'pile' of snow. ----- Now one might have been told, or think intuitively, that most of the snow during the Ice Age would have fallen near the North Pole. That would be the center of the pile and the Ice Sheet would spread southerly over northern Europe and North America. Not so. The high Arctic is a desert, and has little snow. It is simply too cold for the air to hold much moisture. It is estimated that a ball the size of a grapefruit, lying on the arctic tundra, would probably not be covered by snow more than a few times during an arctic winter. Most of the snow fell on the North American continent during the Ice Age in a band about 55 to 60 degrees north - about central Hudson Bay and northern Quebec. That's about as far south of the Pole as South Carolina is north of the Equator. That snow band formed far south of the Pole where the air had abundant moisture, but where is was cold enough to not all melt in the summer. So the snow pile mounded, and like honey, flowed in all directions from central Canada. It not only flowed south to blanket the northern states, but north to cover the Pole! ----- There is a global water budget. Unlike our family budgets, little is added or subtracted from the total water budget. However, there are many ways to allocate water within the budget. Virtually all of Earth's water is allotted to the World Ocean. Some is assigned to lakes and rivers, some to vapor in the atmosphere, and some frozen as ice. During the colder times of the Ice Age, that pile of ice on the continents grew so high that a much larger portion of all of Earth's water was trapped on land. The budget had to balance, so the withdrawal was from the oceans. Sea level fell hundreds of feet worldwide, extending the east coast of the U.S. hundreds of miles to the east. Alaska connected to Siberia and England was no longer an island. ----- The Mississippi River, today, is a mighty river. It is, however, a trickle compared with its former days. Every spring, the warming air would melt ice into billions of gallons of water. The water would cascade off the ice front in great waterfalls. Water would pour deep into the glacier through crevasses, hollow tunnels through the ice, and converge into sub-ice rivers. 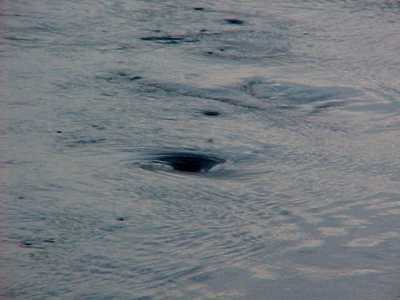 These would surge out from the front of the ice sheet and coalesce into massive floods of water. There was no St. Lawrence River or any of the great Canadian rivers that pour northerly into Hudson Bay or the Arctic Ocean today. Ice blocked the passage of water to the north. Virtually all the meltwaters poured southerly. Today's Missouri and Ohio Rivers demark the southern boundary of the Ice Sheet. They were carved by the unimaginable volume of water pouring off the ice. Together, they converged near present-day St. Louis to make a huge ancestral Mississippi, perhaps with a volume of floodwater in the spring that would exceed today's Amazon. Eventually, for reasons only worth speculation, Earth began to warm, signaling the end of the last Ice Age. Now, the water budget had to be rebalanced. As the vast thickness of ice, piled on the continent, melted, water flooded toward the ocean. The result was an incredible volume of water released to pour down the Mississippi and its tributaries, eventually to enter the Gulf of Mexico. ----- What a river is was! In spring floods, it swept back and forth across the mid-continent like a snake gone mad. 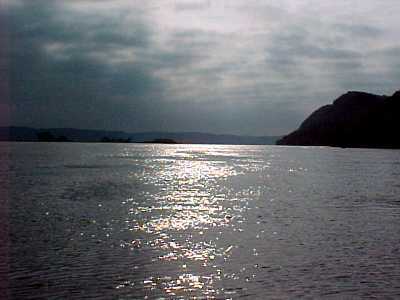 The serpentine course of the river was tens or even hundreds of miles across the loops. And every year, with new floods, the loops themselves would migrate down stream (like a Sidewinder looping through sand). Grab the end of a jump rope or piece of line, leaving the lower end free. Gently whip it back and forth and watch the loops migrate down the rope. That's how the bends of the Mississippi, tens of miles across, looped down the land toward the Gulf! ----- The glacial meltwater left an indelible imprint on today's Mississippi. But there was another equally important effect - sediment. The weight of two miles of ice is enormous. Now slide it over the land. No army of bulldozers could grind the underlying land as much as that moving ice could pulverize in a day. Virtually all the soil of eastern and central Canada was scraped off, leaving the hard unyielding crystalline rocks of the ancient core of the continent, the Canadian Shield, exposed in Quebec and Ontario. The debris was transported to the southern ice margin, either by the moving ice or by the water flowing within it. Huge mounds of Canadian mud, sand, and gravel were heaped on the northern U.S. Floodwaters swept much of it downriver. But, there was so much sediment that the rivers simply couldn't carry it all. 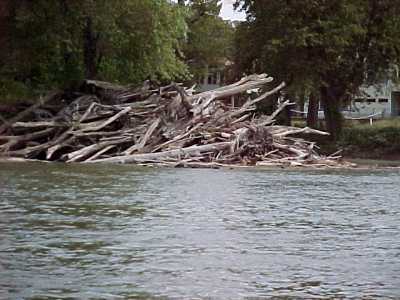 As the spring floods receded, and the river energy diminished, piles of sediment were dropped into the river channel. The river braided and divided into hundreds of side channels creating cutoffs that stranded former loops as scimitar-shaped ox-bow lakes. Shoals, islands, sloughs, sandbars, and vast wide bottomlands formed every year to disappear in next year's floods. During winter, when the waters were low, Natives walked across the valley of the Mississippi - hundreds of miles wide - from island to island with fords seldom more than thigh deep. ----- Trees covered the islands and vast grassland prairies grew over the bottomlands, where trees had been burned by Natives or lightning strikes. Bison, deer, elk, and moose flourished and so did the Natives. ----- At the end of the Ice Age, only 10,000 years ago, the great source of the floods and debris was gone. The water, formerly trapped on land as ice, had returned to the oceans and sea level rose to present heights. But the huge valleys carved by glacial water remained - vestigial remnants of a frozen time. The terraced bluffs, that are the true banks of the Mississippi Valley, may be a hundred miles apart, and the great river still twists its way south, with the loops winding first to one far bank and then, years later, to the other. ----- Much of the glacial debris carried southerly by the Mississippi lies as the Louisiana Delta - that great bird-foot of mud and sand jutting far out into the Gulf below New Orleans. Some of the glacial rubble has washed off the delta during floods and storms. Longshore currents have carried the remains of Canadian topsoil and dumped it as sand bars and islands along the Gulf Coast, lining the Texas coast as far west as Mexico. ----- But the Ice Age rivers did not complete their job - the workload was more than they had energy to finish. They ran out of ice to melt before the work was done. There remained a vast sheet of ground-up Canada spread as a blanket over the northern portion of the U. S. The Mississippi today is choked with shoals and sand bars. It continues to braid through a complex of islands and sloughs. Every spring, when the great river is energized by melting snow, it seems to regain its memory of past Ice Age glories. Brown churning water floods southerly, covering bottomlands, shifting shoals and bars, ripping out islands and creating others anew. Whole trees - even whole forests - are ripped from their tenuous grip on sandy floodplain soil to begin a spinning, thrashing, bark-skinning journey toward the Gulf. ----- To witness the Mississippi in flood is awesome - and humbling. To be trapped in her floodwaters, frightening and often lethal.